quality white chocolate for the filling—nothing worse than a cheap white chocolate, I say. Green & Black’s, Lindt, Valrhona or Guittard are excellent brands, in my book. Happy Valentine’s Day! 1. Position a rack in the center of the oven and preheat the oven to 350°F. 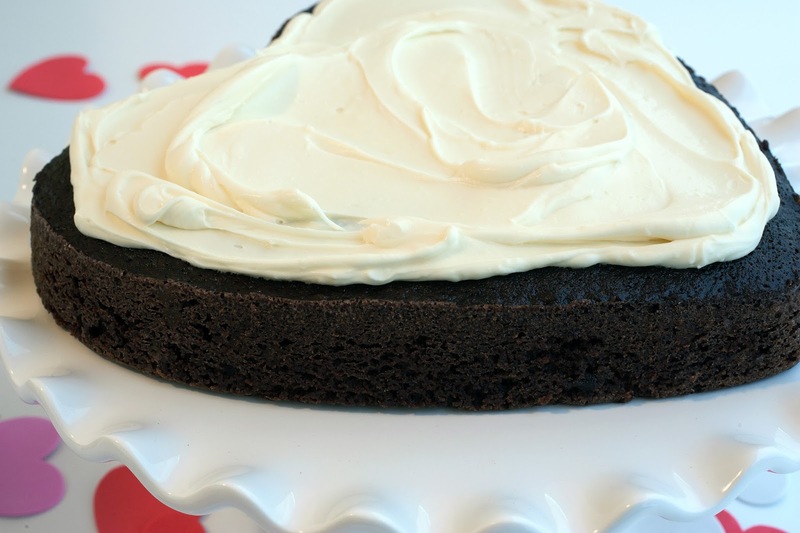 Grease the bottom and sides of two 9-inch heart-shaped (or round) cake pans with shortening. Line the bottom of the pans with parchment paper, cut to fit, then grease the paper. Dust the paper and sides of the pans with flour and tap out the excess. 2. In a medium bowl, sift together the flour, cocoa powder, baking powder, baking soda and salt. Whisk to combine and set aside. 3. In the bowl of an electric mixer, using the whisk attachment, beat the eggs at medium speed. Gradually add the sugar and beat at high speed until pale and fluffy, about 2 minutes. Reduce the speed to medium and beat in the oil, melted butter and vanilla extract. Reduce the speed to low and add the dry ingredients in three additions alternating it with the coffee in two additions, beginning and ending with the flour, and stopping to scrape down the sides of the bowl with a rubber spatula as necessary. Mix just until blended. Remove the bowl from the mixer stand and give the batter a few stirs with the spatula to make sure it’s completely blended. Divide the batter between the pans and bake for 20 to 25 minutes, until a toothpick inserted into the center of each cake comes out clean. Cool the cakes in the pan on wire racks for 15 minutes. Unmold the cakes onto the racks and cool completely. 4. In a small saucepan, combine the heavy cream and coconut and bring to a gentle boil over medium-high heat. Remove the pan from the heat, cover, and allow to infuse for 1 hour. 5. Strain the cream (discard the coconut) and measure it – you should have 1 cup. If you have too much or too little, adjust the amount accordingly by adding or removing a little cream. Return the strained cream to the saucepan. Place the chopped chocolate in the bowl of an electric mixer. Place the cream over medium-high heat and bring to a gentle boil. Pour the hot cream over the chocolate and let it stand for 30 seconds. Gently whisk the mixture until the chocolate is completely melted and the mixture is smooth. Cover the bowl and refrigerate the ganache for at least 4 hours, until thickened. 6. 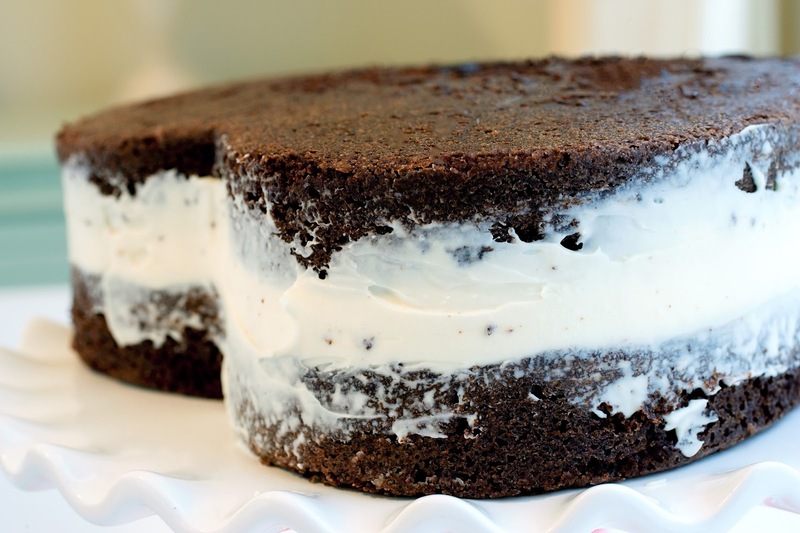 Place one of the cake layers right side up on a cake plate. 7. Place the bowl containing the ganache in the mixer stand and, using the whisk attachment, whip at medium-high speed until soft peaks form (do not overwhip the ganache or it may become grainy). Spoon 1 cup of the whipped ganache onto the cake layer on the plate and spread it into an even layer, up the cake edge. Place the second cake layer on top, upside down. 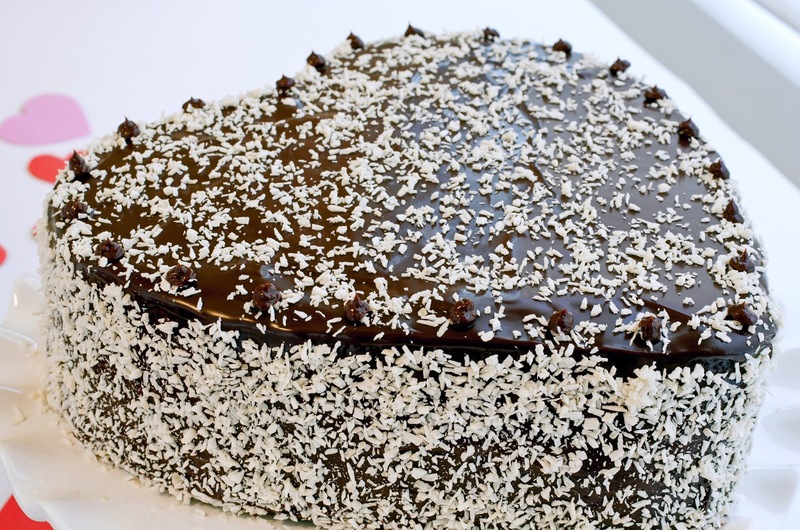 Spread the remaining ganache around the sides of the cake in a smooth, thin layer to cover the gap between the layers. 8. Place the chocolate in a medium bowl. Place the cream and corn syrup in a small saucepan and bring to a boil over medium heat, stirring occasionally. Pour the hot cream over the chocolate and let it stand 1 minute, then stir until the chocolate is completely melted and no bits of chocolate cling to the sides of the bowl, at least 2 minutes. Let the glaze stand for 5 minutes. 9. Lightly spray a wire rack with non-stick cooking spray. 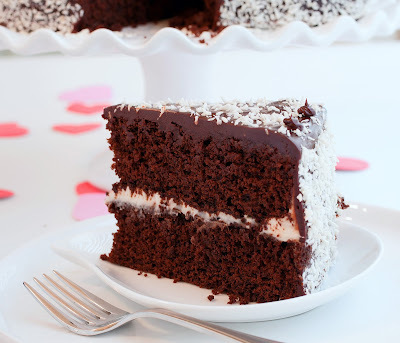 Remove the chilled cake from the refrigerator and slide it from the cake plate onto the wire rack. Place the wire rack on top of a baking sheet. Pour the glaze quickly and evenly over the chilled cake, starting around the top edges to allow the glaze to evenly cover the sides, then cover the center of the cake. Place the cake, still on the wire rack and baking sheet, in the refrigerator to chill for 1 hour (let the glaze stay on the baking sheet to chill, too). 10. Slip 3 strips of waxed paper under the edge of each section of the cake. 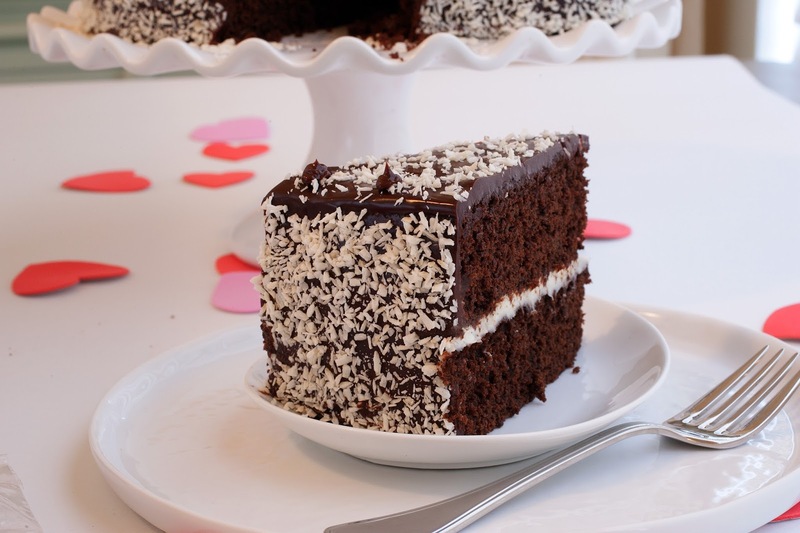 Using your hand, pat the coconut all around the side of the cake. 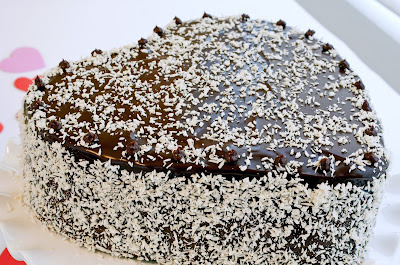 Sprinkle the top of the cake with the remaining coconut. Remove the waxed paper. Transfer the remaining chilled glaze into a pastry bag fitted with a plain 3/16-inch tip (Ateco #801). Pipe small dots of the chilled chocolate glaze around the edge of the top of the cake. Refrigerate the cake until ready to serve. Serve the cake near, but slightly cooler than, room temperature.